As part of its annual charity program designed to give back to those in need, Mazda North American Operations (MNAO) today announced the start of the 2016 Mazda Drive for Good® event. Since 2012, Mazda Motorsports has been the sponsor of the Project Yellow Light scholarship to inform drivers of the dangers of distracted driving. Mazda and Omaha Mazda Dealers donated $29,000 to the Children’s Hospital & Medical Center Foundation as part of Mazda’s Drive for Good® Event. To-date, Mazda Foundation has donated one-half million dollars to My Stuff Bags Foundation, helping the organization reach the milestone of providing My Stuff Bags to one-half million children. 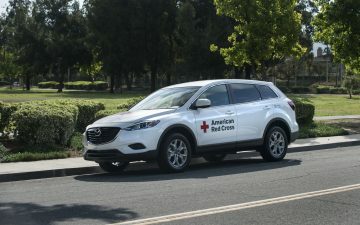 Through support from companies such as Mazda, the Red Cross is able to maintain a variety of resources and equipment that allows the organization to be ready to respond anytime, anywhere to help people affected by disasters. The Northwest Mazda Dealers donated $90,450 to the Seattle Children’s Hospital on April 12 as part of the Mazda Drive for Good program. Mazda Drive for Good is a winter charitable event the proceeds of which are derived from the sale and leasing of Mazda automobiles. The company donated $100 for each car sold or leased during the inaugural year in 2014. For 2015, the donation has been increased to $150 per car.